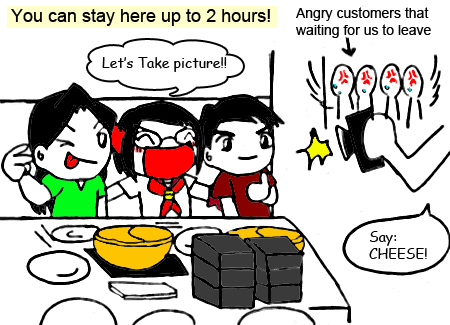 I bet we've make those angry customers feel so frustrated, where they need to wait wee bit longer to have our "photo session" ended. 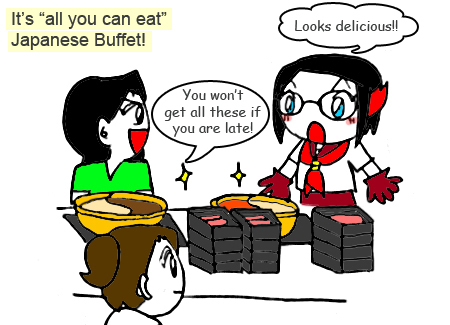 ^^"
It's been a while I've tried Japanese Buffet! The last one I tried is Shogun. 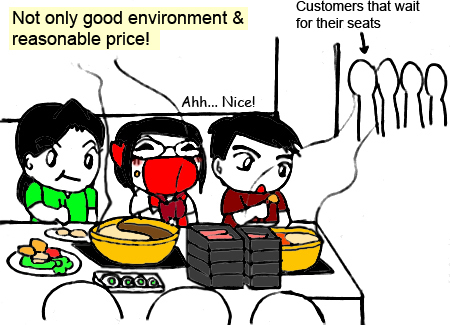 The main reason we tried this Japanese Buffet is very simple: The price! 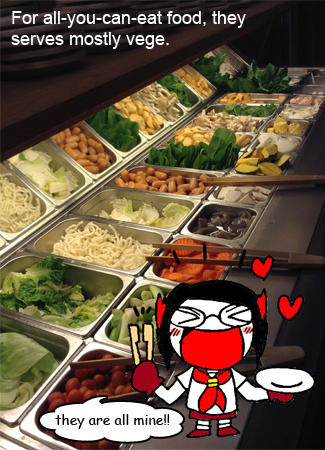 However, the food was so-so only, not much choices in foods as there are only vegetables and 3 meats. 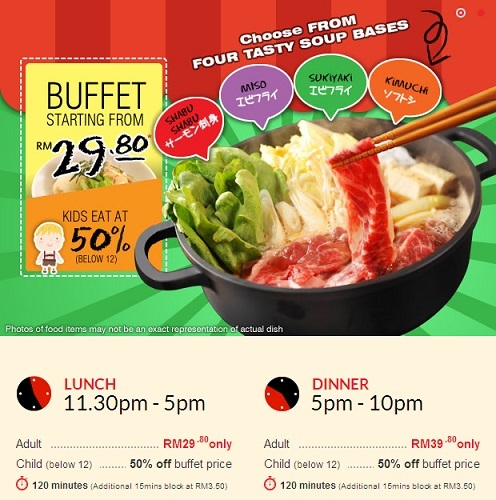 If you are vegetarian or you want to go for cheap buffet, you can consider this! For diners, you get to choose 2 types of soup out of 4. To me, I prefer Kimuchi as it taste like Tomyam! (Okay, maybe not that strong as it's plainer than Tomyam) It lifted up my appetites as I find the rest of the soups are too salty (Salt is my enemy). Unhealthy maybe, but Kimuchi taste less saltier. Desserts only have icecreams, comes with Green tea and chocolate. You can add the topping based on your likings. Customers: "When is our turn??" 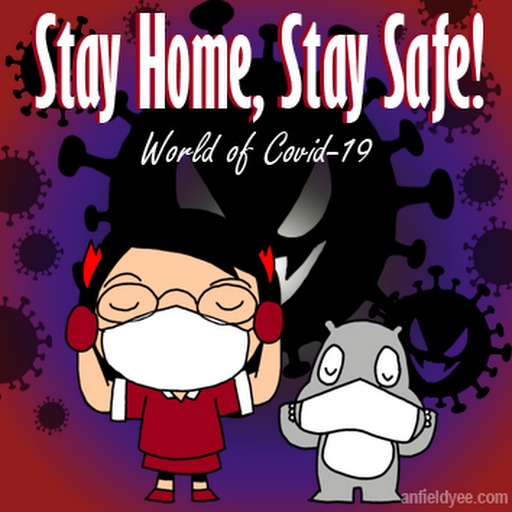 By the way, it's better for you to make pre-booking. Or else, you may ended up queue-ing for long time. 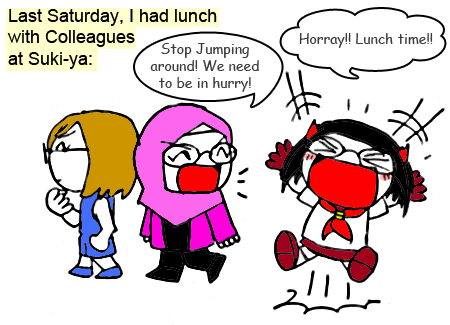 Unless, you come at the non-lunch or dinner hour! Another restaurant that I would suggest if you don't mind queue-ing up would be Two Pesos @ SS2. Full write up here. Suki-Ya can be found at Paradigm Mall and Mont Kiara! Omg! I love Suki-ya! 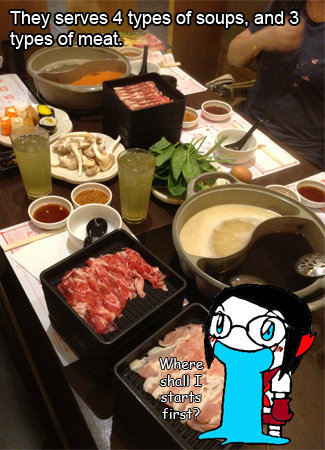 My fav soup is sukiyaki. True that there isn't a huge variety of food but they have what I mainly eat anyway so it doesn't matter to me. And i miss their ice cream! I miss this!